4.2 out of 5 based on 120 bloggers and 33 commenters. 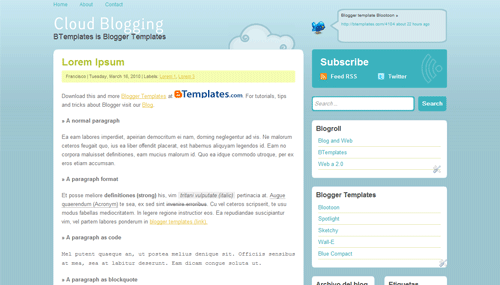 Cloud Blogging is a free premium blogger template adapted from WordPress with 2 columns, web 2.0 design, fresh look, rounded corners, an exclusive design for Blogger, social bookmarking icons and vectorial elements. thanks for this sharing, i like this theme, and i want to use it, for my blogspot. awesome dude. i like a twitter updates on top. can I use and download this template if I have Mac OSX? is it compatible with Safari? No se ven las imagenes de los perfiles cuando los usuarios comentan. Solo se ve una cuadro en blanco … asi esten registrados en Blogger. Podrias solucionar este error ? Dejé un comentario de prueba. Los usuarios deben comentar con sus cuentas de Google (la primera opción) y tener una imagen en sus perfiles; si no, sólo aparecerá el cuadro blanco. En los comentarios que he visto (ej. post “Actualiza tu nokia”) no han comentado con cuentas de Google, porque no me aperecen los links a sus respectivos perfiles. Recuerda también que en Configuración/Comentarios debes tener habilitada la opción “¿Mostrar imágenes de perfil en los comentarios?”. Volvi, oye, si te fijas al buscar cualquier cosa en la barra de busqueda esta muestra siempre la portada y no los resultados de buscado. Osea que la busqueda no funciona… que puede ser ? Alguna otra solución, porque aun sigue sin servir ? El hecho es que lo que tu me pides que coloque ya esta exactamente como debería ser y aun así no funciona. Muchas gracias y perdón por las molestias. Espero tengas otra solución ??? PD: cuales son las etiquetas para poner codigo HTML aquí así como tu ? I like this theme, and i want to use it for my blogspot. Thanks for this beautiful support. I love the template. I’m trying to use it now, but when I replace my username for Twitter, my feed doesn’t come up. Anyone have a suggestion for this? This theme is super. I really want to thank you very much. I wil you follow with twitter and rss. @LuisG Blogger esta teniendo problemas con los botones para compartir, puedes o desactivarlos desde el panel o esperar a que lo arreglen. thanks for sharing this cool theme, i want to use it for my blogspot..
My share buttons are invisible and making a huge gap between posts. Does anyone else get this problem? Remove that entire code and save changes in your template. This will remove that big white space. @Claudia: Thank you for replying. However I found this other bit of code with the links to facebook etc. in it that when deleted kept the links, also had them work and deleted the white space (however the icons look greyed out). Puzzling. Hola, quisiera saber cómo modificar el font-weight del titulo del blog, para ponerlo a bold, si es que se puede. De hecho no se actualiza a bold aunque escriba en el editor de CSS de blogger. Hello, I would like to thank you for this template but at the same time I would like to point to the author of this template that I don’t think it’s necessary to put the attribution (it’s yours and I obviously thank you and I understand and totally agree that it should be there) some other place, not in the middle. Somewhere in which people can see it but it’s not obstructive.